This year Income Tax return filing has become slightly complicated. The government of India has made several changes related to Income tax and ITR. All these changes are made recently. So, if you are waiting untill last minute for filing your ITR, time has come to wake up and act fast. 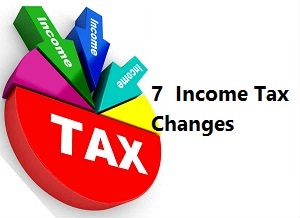 Here are 7 new Income Tax changes done by the government recently. Until today, it was not mandatory to file income tax return if taxable income was below Rs 2.5 Lakh. However, from this year onwards if exempted income like long term capital gain exceeds Rs 2.5 Lakh, it is compulsory to file income tax return. For example, if you have redeemed mutual funds after holding for long term. The value of redeemed mutual fund is above 2.5 Lakh. The entire income is exempted. So, if you don’t have any other income it was not compulsory to file ITR until last year, but this year onwards you need to file ITR in such cases. As per new rule Linking of Aadhaar and PAN is mandatory to file Income tax return. So, if you have not linked your Aadhaar with PAN card you need to do it before filing ITR. The process is simple you need to visit income tax e-filing portal and provide information about your Aadhaar card for linking. In case of mismatch in data, a system will not allow you to link Aadhaar with PAN. You need to correct either PAN card or Aadhaar card data. This year number of ITR forms are reduced from nine to seven. Few ITR forms are merged and simplified. ITR-2A and ITR-3 is combined into ITR-2. One single page form ITR-1 (Sahaj) is introduced for the Salaried people earning up to 50 Lakh, interest income and income from the single property. The people earning above 50 Lakh or owning multiple properties need to file ITR-2. If you are high-income earner 50 lakh and above until last year it was mandatory to disclose your asset and liabilities which include immovable property, cash in hand, jewelry and vehicle. This year, the scope is widened and tax payers need to disclose mutual funds, stocks and insurance also. This year ITR contains a special field of Cash deposit during demonetization. If you had cash deposits over Rs 2 Lakh during demonetization, you need to report the same in ITR. Along with amount you need to provide IFSC code and account number. Now you can revise your return even if you don’t file it by July,31 deadline. An earlier revision of ITR was not allowed if a return was filed after deadline. Now you are free to revise return till 31st March,2019. Now, it is mandatory to mention 12 digit Aadhaar number or 28 digit Aadhaar Enrollment number while filing Income tax return. If you have long term capital gains from equity shares, no short-term gain or carry forward loss, do you need to file ITR-2 or use ITR-1 and include the exempt amounts in subject columns? You need to file ITR2. I was not aware of many of the above points. But, now i can plan & file my income tax return accordingly.